The new year has arrived and I'm back with a Belgian guesthouse that has knocked my socks off. 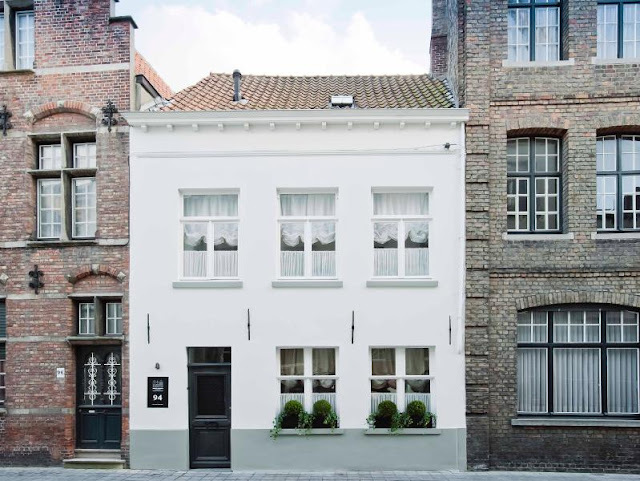 This gem of a townhouse is in the center of Bruges, the capital and largest city of the province of West Flanders in the Flemish Region of Belgium. Although the apartment was recently restored, the old world charm has not been at all diminished thanks to expert interior designer Natalie Haegeman. 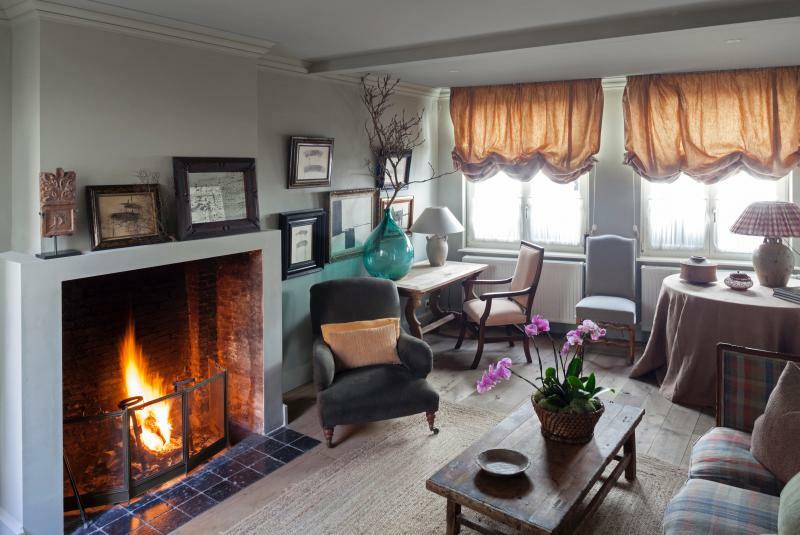 Charming and cozy, the living room possesses its original oak floors and wood-burning fireplace. The eat-in kitchen stole my heart. 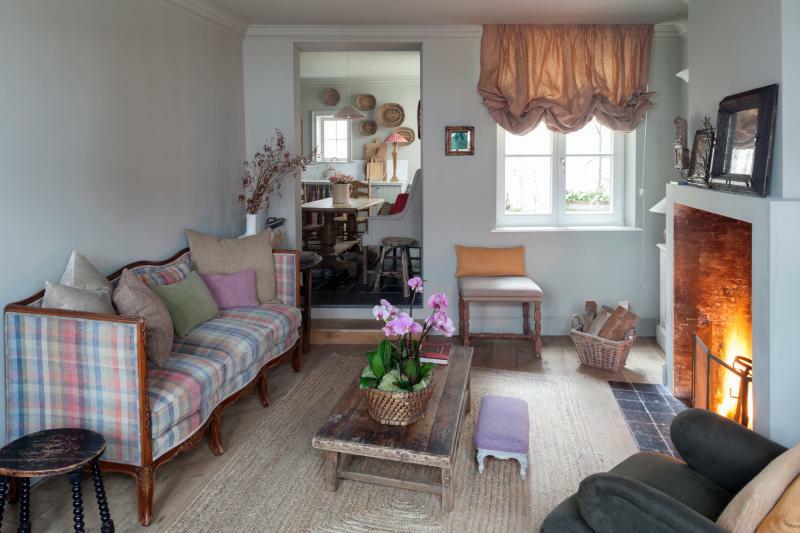 This could be found in a Cotswold cottage. 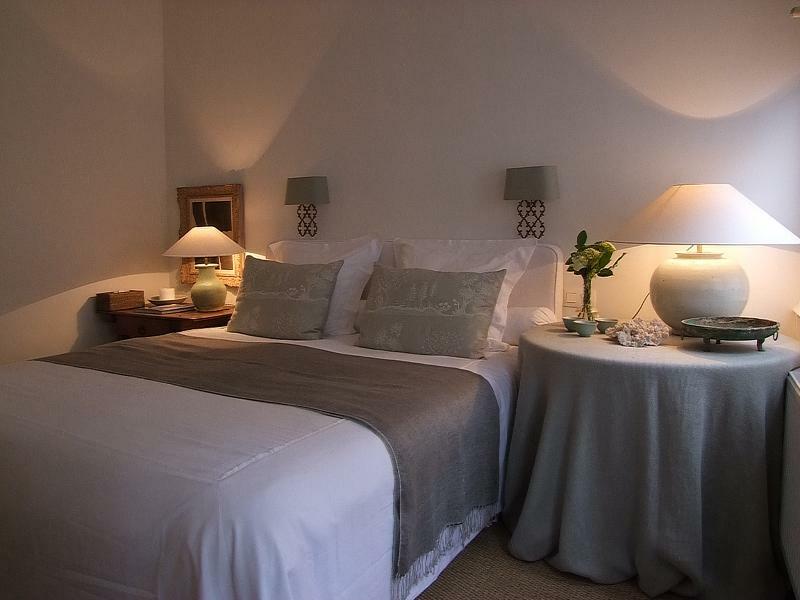 Subdued colors and soft lighting make the master bedroom, on the second floor, very serene. 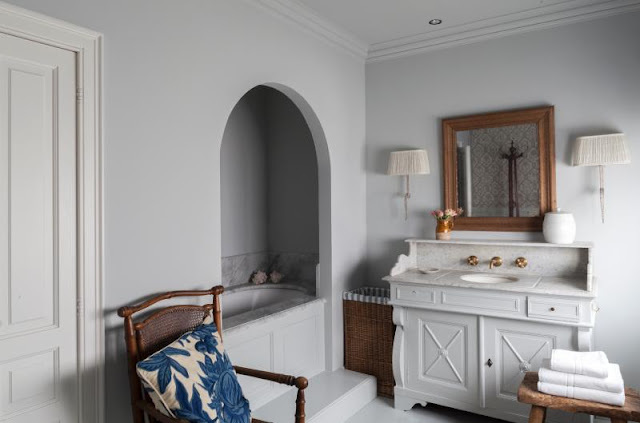 The master bathroom is dreamy. I could feel quite pampered here. 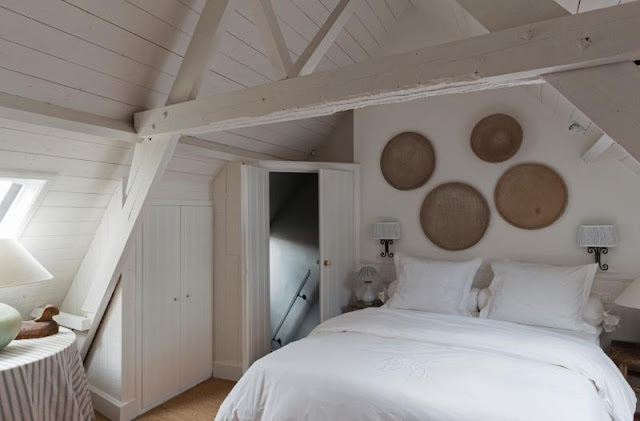 I love the attic bedroom under the eaves; plank walls and ceiling, open beams. So charming. The second bath vanity is delightful. A private terrace is accessed from the apartment. Just a little space to rest and enjoy a cuppa. For outdoor scenery, it's the neighborhood that beckons. . . I'm of Belgian descent on my mother's side. Are you familiar with the country of Belgium? The Belgian guesthouse is charming inside and out! 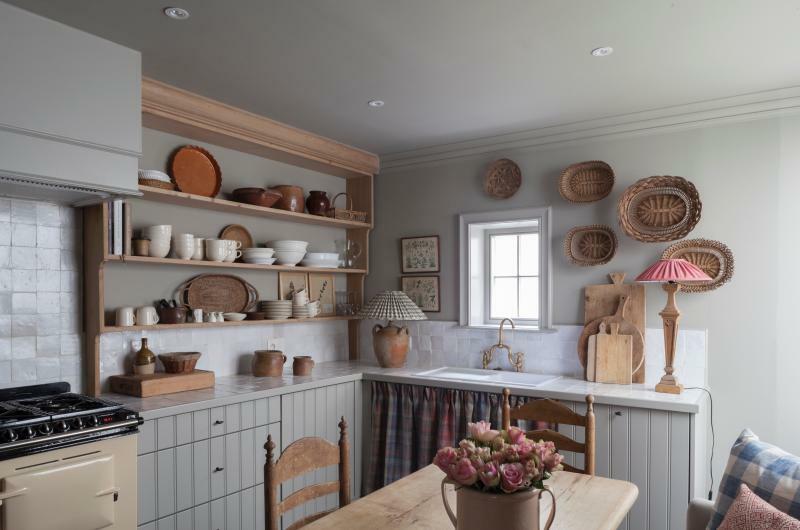 I love the neutral tones with natural wood accents throughout, especially in the lovely kitchen! 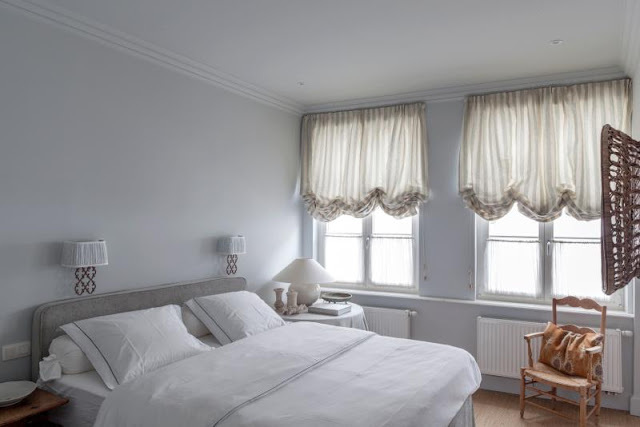 The window treatments are soft and pretty and perfect for privacy on a well-traveled street. I could move right in! Thanks for sharing and Happy New Year, Nancy! I first noticed the uniformed curtains. They would make me stop and admire if I was walking by. Then I noticed all the use of fabric. Love it! My notepad and pencil are busy taking notes! Nancy I've been in neighboring countries but not in Bruges, Belguim. We are traveling back to the Netherlands this year and a short stop of a day to meet a fellow blogger friend in Hamburg Germany perhaps we need to stop in between in Belguim for an extra day. I did not know you have a heritage in Belgium roots on your Mom's side. The townhouse is soothing in color's and beautifully decorated, I could imagine dwelling there enriches the soul. Just love the cottage....furnished beautifully so cozy and the outside is just so welcoming! 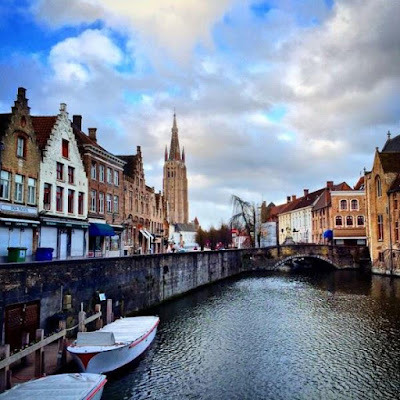 Bruges is one of my favorite places that I've been to. I can imagine walking down the side alleys and happening upon this adorable house. I was taken with it from the first photo of the exterior. So charming...and I love that tiny garden area! So wonderful Nancy. Be still my heart on that kitchen!!! So charming. Another great cottage this week Nancy. Hope your new year is starting off great. there are SO many reasons to adore this dwelling. for a few years then let you know for sure. wink. Hope you are loving your new space. OK Nancy, you did it again. You made me say once again, "THIS IS MY FAVORITE COTTAGE OF ALL!" Like I said before, it started with that little Spanish cottage a few months ago, then a French cottage, now THIS ONE? YES! All the perfect white (I wonder what shade of white that is?) 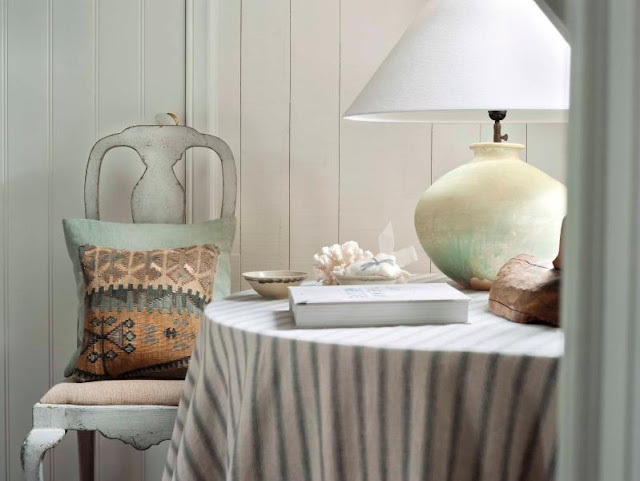 and the soft grays are so lovingly blended together to truly create a serene atmosphere. I have always loved the Belgian style for its simplicity. That simplicity however is not easy to achieve. I think it takes a lot of skill to know what objects to include into the décor and also what shade of whites to choose. 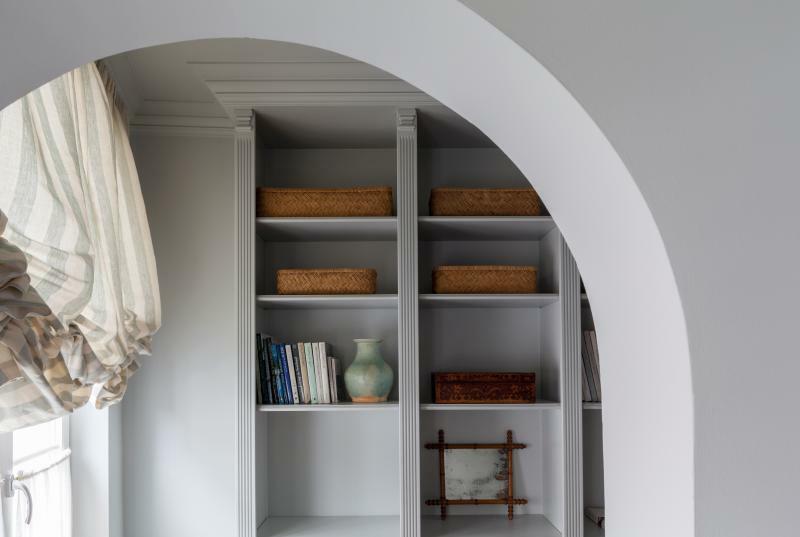 Some whites can be cooler than others and some grays too blue; these grays are warmer with almost a brown to them, or maybe it's just the tones of the wood that warm things up. All I know is that I am going to paint my kitchen this summer WHITE and add elements of gray! The stucco of the building is also charming. Oh dear, I MUST SEE BELGIUM before I leave this earth! Fabulously done dearest Nancy AND, I love your new profile photo! You look ravishing with your beautiful new hair cut! 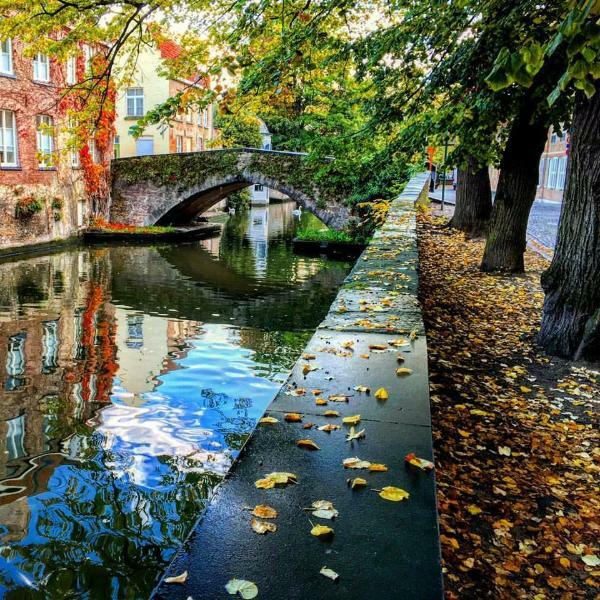 Bruges ~ The Venice of Belgium. A lovely city we visited in the spring of 1973. What a wonderful cottage/apt. this is I could picture myself living there. Thanks again for yet another lovely post on small spaces around the world. That is a darling place. Notice how steep those attic steps must be? The handrail practically goes straight down. Yes, very steep. Pretty typical for homes of this age. Love the scenes of Belgium. Such a cute little place - I could get used to that bathtub alcove!! What a lovely spot in Belgium - which actually is a country in Europe I keep missing during my travels, and it is near the top of my 'must go there' list. Happy New Year dear Nancy - I almost didn't recognize you in your new photo - love your short haircut! 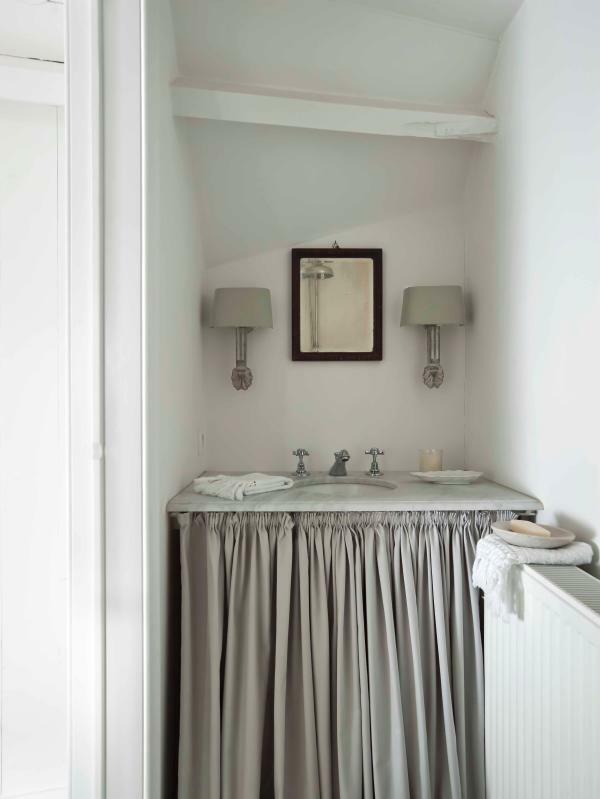 Thanks for all the great cottages you shared in 2015 - hope you spoil us again this year, it's always encouraging to see what small spaces can look like, especially your very own gem - I have one and sometimes need help! Goodness, that scenery is enchanting! Happy New Year, Nancy! I love the peaceful feeling I get from every single room! Happy New Year! 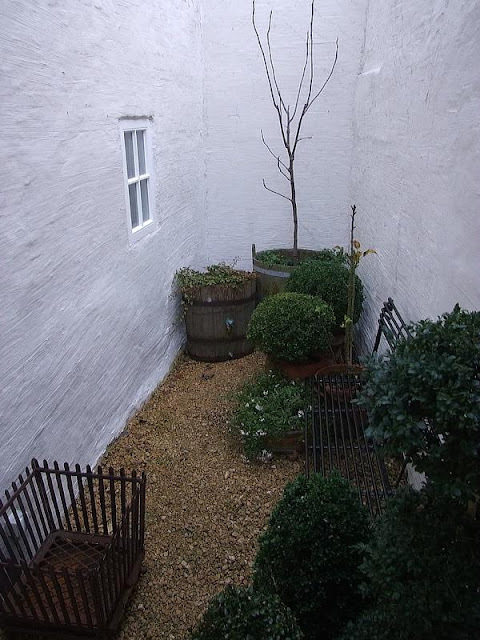 I used to live in an apartment with a private courtyard like that! You brought back memories. No, I do not know a lot about Belgium. I would not mind learning more. Right now I am studying more about Cornwall. I love the name and idea of Belgium but have no idea of it's culture, style or anything about it! I could figure all that out though while staying in this charming place!! I know where I am going on my next vacation. I doubt I can find a best in all that you show me. Could any of us, we love the cozy, cottage style. Second, the cozy, eat in kitchen. . . The master bedroom . . . I have my pillow handy . . . The warm fire was the best part of the front room . . .
Lovely Nancy . . . great pick! Glad you enjoyed it, Lynne. I do know some things about Belgium although I have never visited there. Tucked in between Germany, France and the Netherlands, it suffered greatly in the European Wars. But its people are valiant. I loved that fireplace and living room. When I saw the kitchen, I was drawn to the china and crockery on the shelves--first thing I thought of was, uh-oh, they'll all fall off in an earthquake! Living in an area prone to earthquakes creates a decided dynamic in collecting breakable objects, that's for certain. I've been to Belgium before and I would love to return one day. It's such a beautiful country. Love the cottage you chose Nancy and your new profile picture is beautiful. I agree with everything Kim said. So happy I came upon it! It's interesting to see such a quaint little house amongst others that tower above it on either side. Inside the home is really cosy too! I love how everything looks like it's in its own place without looking like a mess that needs to be put into storage.